For qualified experts who can take care of your termite problem in Peoria, contact the exterminators at Varsity Termite & Pest Control. Termites are some of the most difficult pests to deal with. Destructive and plentiful, they can be quite a pain to take care of, especially if they create a considerable amount of damage in your house. At Varsity Termite & Pest Control, we offer free termite inspections so that we can determine the extent of the termite damage in Peoria and make sure that we come up with the right course of action to eradicate these pests from your home. We hold an A+ rating with the Better Business Bureau and have many five star reviews on both Google and Yelp. For quality termite removal in Peoria, trust Varsity Termite & Pest control to get the job done. 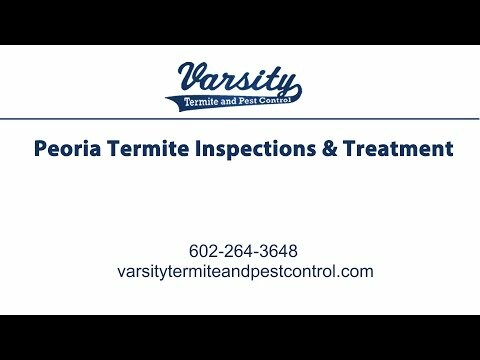 Get thorough and extensive termite inspections in Peoria from the exterminators at Varsity Termite & Pest Control. At Varsity Termite and Pest Control, we provide quality pest services in Peoria to make sure your home is free and clear of unwanted pests using a variety of methods including the Sentricon Termite Colony Elimination System. For extensive scorpion control in Peoria, trust the exterminators at Varsity Termite & Pest Control to drive these unwanted pests from your home. They say that there are only two kinds of houses in the Phoenix area, those that have termite problems and those that will. But does your property have to experience termite damage or be targeted for termite control in Peoria? Every single day homes in Peoria are being silently attacked by insidious little wood eating creatures called termites. Before human settlements arrived in the Phoenix valley and Peoria, there were 1000’s of colonies of termites feasting on the Sonoran Desert floor. Give termites food, a water supply and some juicy wood to eat in a sheltered environment (your home! ), and they’ll flourish. With the influx of the human population, termite infestations in Peoria are an every day occurrence. With over 55,000 households in Peoria alone, termites have a limitless supply of fresh food for years to come. A Peoria pest and termite exterminator can help you to avoid a calamity: the loss of your home to termites. Make no mistake, termites are a big problem, to the tune of five billion dollars a year.. The reason termites can pose such a threat to property is largely due to their dietary habits as well as their social organization. To begin, even though termites are members of the cockroach family (order Blattodea), it is only about 10% of the 4,000 different species of termites that can be classified as pests and are the ones you want to call a termite control service in Peoria about . In fact, in tropical areas some termites even serve a vital ecological purpose. Termites eat debris and enrich the soil. In addition as they consume plant detritus and feed on decaying vegetation, they help clear the way for new growth. So, some termites aren’t that much of a problem if any, and are obviously not anything to be concerned about. The ones that live near human inhabited areas, however, are a source of major concern. Let’s say your house has little to no wood in its construction, so you are not worried about termites.} Unfortunately, it is not that simple. In an ideal world, termites would only eat one variety of wood, and we could build our buildings appropriately. All one would have to do is build their home or office out of materials that termites wouldn’t want to eat. However, termites also eat many other materials including: plastics, paint, silicone adhesives, paper, cloth, and carpets. Sometimes, termites might not eat non-wood products, but they will also sometimes use them for nesting materials. The aftermath of an infestation of termites is ultimately wood damage. Because of their diet, namely wood and cellulose, many termite species damage buildings that are unprotected, as well damage or even destroy other wooden structures. When the termite damage reaches catastrophic levels, it’s too late. It is a far better idea to get on the phone to a termite control service in Peoria and have a termite inspection done to stop the problem before it gets worse. Termites are regarded as pests because of the level of damage they can cause. For example in India, termites ate the equivalent of roughly four thousand US dollars in April of 2011. Termites, like humans, favor temperate latitudes, occurring between 50 degrees north to 50 degrees south. Termites can cause both severe property damage to the tune of several billion dollars a year. Termite hives often have termites in the millions, and produce methane, a known greenhouse gas. Schedule Your Peoria Termite Inspection Today! With all that in mind, you can see why exterminators that provide termite control in Peoria are often so busy. Termites can never be totally exterminated, but they can be controlled. Store bought termite traps may or may not work. A termite inspection is your only way short of having a wood structure collapse. So ask yourself when you’d rather know? Before your home has been damaged is probably your best choice. So call Varsity Termite & Pest Control, your local Peoria termite exterminator and protect both yourself and your property from becoming a statistic.